We started our our holiday trip to Malta at 11.28am on a cold snowy morning, the journey to Heathrow to meet our fellow travellers was long and arduous. 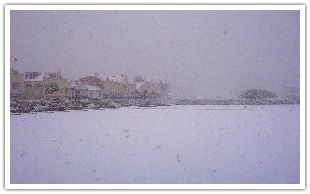 The flight could not land at Heathrow so it landed at Gatwick instead due to heavy snow. 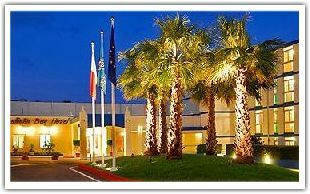 Eventually we all ended up at Gatwick for take-off at 22.30pm arriving in Malta in the early hours of the following morning being met by a smiling Rachel Cardona, a representative of Gollcher Travel and an associate of Mercian Travel, who would be looking after us during our stay. 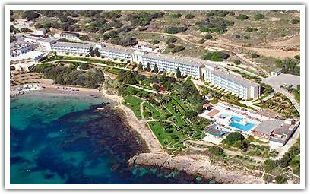 After a very short journey in a mini coach through the dark quiet streets of Malta we arrived at the Mellieha Bay Hotel where we were quickly given our room keys and gratefully fell in our beds. All too quickly Monday morning dawned and breakfast beckoned with our proposed meeting at 10.30am with the Manager of the hotel. The sun shone and the coffle smelt good which nearly made up for the horrible day before. 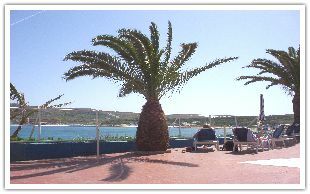 The grounds of the hotel are extensive and with the building taking up the whole of the left hand side of the bay and being only 3 stories high, clean , white, and very imposing. 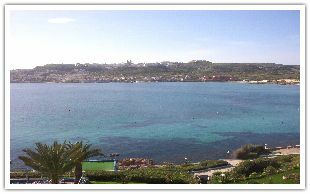 The lovely gardens with benches dotted around for quiet time to enjoy the view of Mellieha beach and towering above the village with its imposing church and with the bus stop close at hand, easily accessible . Some of our party did actually walk back from the village to the hotel. 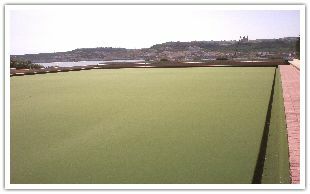 The bowling green with the bay as it's backdrop, was excellent. Lots of sitting all around and umbrellas either end of all rinks for shade. A cupboard full of equipment, and once again the beautiful surroundings of the bay with the warm sun shining off the glorious blue water. 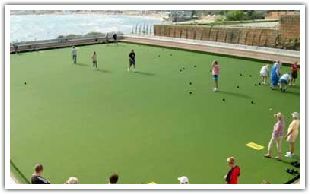 Visit the Mellieha Bay Hotel and enjoy the very popular game of Lawn Bowls. They have a 5 Rink Competition size Bowling Green. The surface is a synthetic needle punched type which was installed by Green gauge of UK. Drinks and a light lunch on the terrace over looking the pool, what more could you ask for? maybe a little sleep to catch up from the day before, and get ready for the evenings dinner and entertainment. 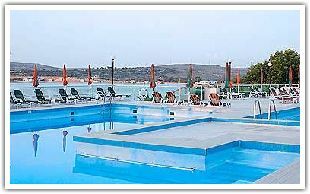 The Mellieha Bay Hotel is superbly located close to the largest golden, sandy beach in Malta and yet only 3 kilometers away from the bustling village of Mellieha. 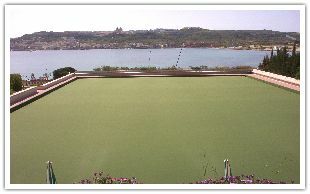 This brings beach and bowling, tennis, table tennis, diving and dancing, chilling and shopping all within easy reach. The choice of menu was an excellent 3 course buffet style meal and the entertainment, in a well presented function room was great, after a little dancing, listening to a singer and watching a dance troop. Our first stop was Mosta church which boasts the 3rd largest unsupported dome in the world . In Mosta we were also introduced to one of Malta's food specialities called "pastitzi" which are small savroy flaky pasteries filled with either peas or ricotta cheese, eaten warm they are delicious and at onlt 23cents unforgettable! We then headed to Valletta where the coach dropped us off at the Upper Barracka with its wonderful views over Grand Harbour. Walking through the grid system of streets, Rosa gave us a potted history of Malta's Knights of St John as we walked towards the unimposing facade of St John's Co-Cathedral. On entering the side door our eyes were bombarded with the most glorious painting, silverware, mosaics and tapestries. We could possibly apppreciate the sights at one visit but it certainly whetted my appetite for a second visit. We also visited Victoria Square where there are cafes where Maltese men and women put their troubles to right but unfortuntanely we had no time to indulge in such pleasures as our coach was waiting for us to be transported to Talq Ali a craft village where we were able to visit a glass blowing factory and see some exquiste glassware and also filigree gold and silver shops where some of us couldn't resist the temptation and indulged in a bit of retail theraphy! Rosa was an excellent guide having been in the business for some 30 years. Her enthusiasm and love of the Island of Malta was very evident and infectious. We were treated to lunch, where the wine flowed very freely, at a restaurant in the quiet city of Mdina. Then after a walk round the battlements of the old city we gratefully boarded the coach back to our hotel where I must admit I fell onto a sun lounger to soak up some sun and pretend I was reading a book. At 7.30 pm having been refreshed by firstly a shower, we all met in the lounge, some with welcome drink, and waited for the coach once again to transport us out to dinner. We had been invited out by the Maltese Tourist Office to a restaurant in St.Julian's bay called Paparazzi where once again wine flowed freely as did the chat. We stubbled back onto our coach like cinderella at midnight ready for bed and hopefully face another full day of bowling. Wednesday was a free day and we all decided we would venture onto the green for some bowling. After a short game of 'straight' bowling we were treated to the delights of 'crown green' and a riotous game was had by all. Hopefully we now have an insight into the idiosyncrasies of one another's game. Lots of laughter and the continued forming of new friendships is a sure sign of a good holiday. 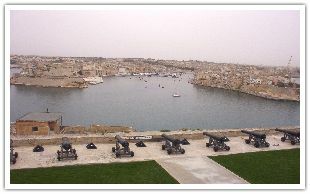 We look forward to meeting lots of new friends when we return to Malta with Mercian Travel. The inclusive cost of this holiday based on sharing a twin bedded room, return airfare, transfers, half board, prizes and services of the Mercian team. 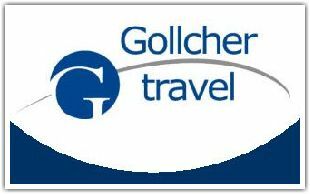 Destination management company, Gollcher Travel, formerly known as President Holidays, is well established and highly recommended by its clients for its core business as a handling agency for incoming tourist groups to Malta.